A theory is a group of related concepts that propose action that guide practice. A nursing theory is a set of concepts, definitions, relationships, and assumptions or propositions derived from nursing models or from other disciplines and project a purposive, systematic view of phenomena by designing specific inter-relationships among concepts for the purposes of describing, explaining, predicting, and /or prescribing. Kerlinger - theories as a set of interrelated concepts that give a systematic view of a phenomenon (an observable fact or event) that is explanatory and predictive in nature. Theories are composed of concepts, definitions, models , propositions and are based on assumptions. Nursing theorists use both of these methods. Theories are for professional nursing. Theory is "a creative and rigorous structuring of ideas that projects a tentative, purposeful, and systematic view of phenomena"
A theory makes it possible to "organize the relationship among the concepts to describe, explain, predict, and control practice"
Concepts are basically vehicles of thought that involve images. Concepts are words that describe objects , properties, or events and are basic components of theory. Models allow the concepts in nursing theory to be successfully applied to nursing practice. Prepositions are statements that explain the relationship between the concepts. Processes are series of actions, changes or functions intended to bring about a desired result . During a process one takes systemic and continuous steps to meet a goal and uses both assessments and feedback to direct actions to the goal. A particular theory or conceptual frame work directs how these actions are carried out . The delivery of nursing care within the nursing process is directed by the way specific conceptual frameworks and theories define the person (patient), the environment, health and nursing. interrelate concepts in such a way as to create a different way of looking at a particular phenomenon. are the bases for hypotheses that can be tested. increase the general body of knowledge within the discipline through the research implemented to validate them. are used by the practitioners to guide and improve their practice. 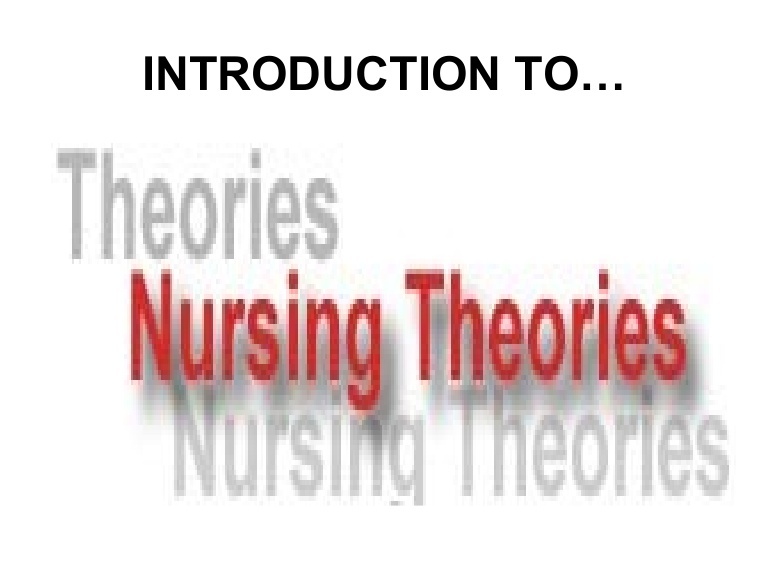 Nursing theories are often based on and influenced by broadly applicable processes and theories. 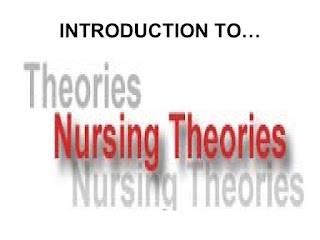 Following theories are basic to many nursing concepts. It describes how to break whole things into parts and then to learn how the parts work together in " systems". These concepts may be applied to different kinds of systems, e.g.. Molecules in chemistry , cultures in sociology, organs in Anatomy and health in Nursing. It defines adaptation as the adjustment of living matter to other living things and to environmental conditions. Adaptation is a continuously occurring process that effects change and involves interaction and response. It outlines the process of growth and development of humans as orderly and predictable, beginning with conception and ending with death. The progress and behaviors of an individual within each stage are unique. The growth and development of an individual are influenced by heredity , temperament, emotional, and physical environment, life experiences and health status. Each of these concepts is usually defined and described by a nursing theorist. Of the four concepts, the most important is that of the person. The focus of nursing is the person. Paplau 1952: Nursing is; therapeutic interpersonal process. Abdellah 1960: This theory focus on delivering nursing care for the whole person to meet the physical, emotional, intellectual, social, and spiritual needs of the client and family. Rogers 1970: to maintain and promote health, prevent illness, and care for and rehabilitate ill and disabled client through "humanistic science of nursing"
Grand theory: provides a conceptual framework under which the key concepts and principles of the discipline can be identified. These theories are based around helping individuals to fulfill their physical and mental needs. Needs theories have been criticized for relying too much on the medical model of health and placing the patient in an overtly dependent position. These theories revolve around the relationships nurses form with patients. These portray the nurse as the changing force, who enables individuals to adapt to or cope with ill health (Roy 1980). Outcome theories have been criticized as too abstract and difficult to implement in practice (Aggleton and Chalmers 1988). Humanistic theories emphasize a person’s capacity for self actualization . Humanists believes that the person contains within himself the potential for healthy and creative growth. The major contribution that Rogers added to nursing practice is the understanding that each client is a unique individual, so person-centered approach now practice in Nursing. A model, as an abstraction of reality, provides a way to visualize reality to simplify thinking. A conceptual model shows how various concepts are interrelated and applies theories to predict or evaluate consequences of alternative actions. A conceptual model "gives direction to the search for relevant questions about the phenomena of central interest to a discipline and suggests solutions to practical problems"
Four concepts are generally considered central to the discipline of nursing: the person who receives nursing care (the patient or client); the environment (society); nursing (goals, roles, functions); and health. To understand why nursing theory is generally neglected on the wards. A nrsing theory should have the characteristics of accessibility and clarity. It is important that the language used in the development of nursing theory be used consistently. Many nurses have not had the training or experience to deal with the abstract concepts presented by nursing theory. Majority of nurses fail to understand and apply theory to practice (Miller 1985). To develop nursing as a profession the concept of theory must be addressed. If nursing theory does not drive the development of nursing, it will continue to develop in the footsteps of other disciplines such as medicine. George B. Julia , Nursing Theories- The base for professional Nursing Practice , 3rd ed. Norwalk, Appleton and Lange. Wills M.Evelyn, McEwen Melanie (2002). Theoretical Basis for Nursing Philadelphia. Lippincott Williamsand wilkins. Meleis Ibrahim Afaf (1997) , Theoretical Nursing : Development and Progress 3rd ed. Philadelphia, Lippincott. Taylor Carol,Lillis Carol (2001)The Art and Science Of Nursing Care 4th ed. Philadelphia, Lippincott. Potter A Patricia, Perry G Anne (1992)Fundamentals Of Nursing –Concepts Process and Practice 3rd ed. London Mosby Year Book.